Hornorkesteret: Today we mourn the premature death of Roald Amundsen on June 18th 1928, 82 years ago. 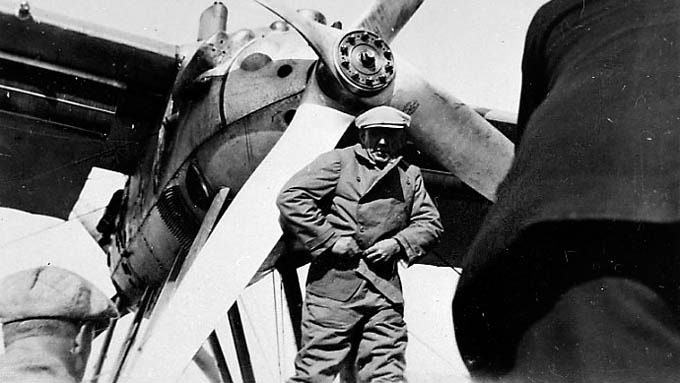 On a rescue mission to save his by then bitter enemy – the Italian general Umberto Nobile who designed the dirigible “Norge” used for the first transpolar flight. The small seaplane Latham 47 left Tromsø as one of many rescue missions to recover the crew of the wrecked dirigible “Italia”. The Latham expedition sent their last radio signals a little later the same day, but then there was silence. Later an improvised raft was found made from one of the Latham 47 ‘s pontoons, and it is believed that the whole crew perished. Two years ago, marking eighty years since the Latham 47 disappeared, Hornorkesteret recorded and released a song in Amundsens memory featuring norwegian polar hero Fridtjof Nansen on vocals, taken from a recording of his memorial speech for Amundsen. Together with other Amundsen-related tracks and sober and fitting cover graphics, this MP3 single can be downloaded from the Panot archive of curious musics – scroll to the bottom to find the “Elegi for Roald Amundsen” MP3 single. The files are kindly hosted by TEKS, Trondheim Elektroniske KunstSenter. Hornorkesteret, The Norwegian Polar Orchestra has, since 1999, played music on instruments made from reindeer antlers and other antlers, as well as drums, bones, flutes, ice, rocks and fire. Hornorkesterets compositional strategy, consisting of both improvisation and set frameworks creates a unique and organic soundscape, and together with our conceptual and visual focus on norwegian polar history, the group has become an exciting and challenging experience. We have fans from all walks of life, construction workers, fishermen, professors, connoisseurs of contemporary music, scientists, rockers and even jazz musicians have praised Hornorkesterets “call of the wild” and the moods the group manages to convey with their primitive antler instruments. “Elegi for Roald Amundsen” is a grandiose, bordering on pompous, piece with Fridtjof Nansen himself on vocal – praising Amundsen as “one of those silent men who DOES things”. The piece drones on behind Nansens dramatic speech in a minor key and ends with a “solo pathetique” played on the soprano antler Høyang Resonator.